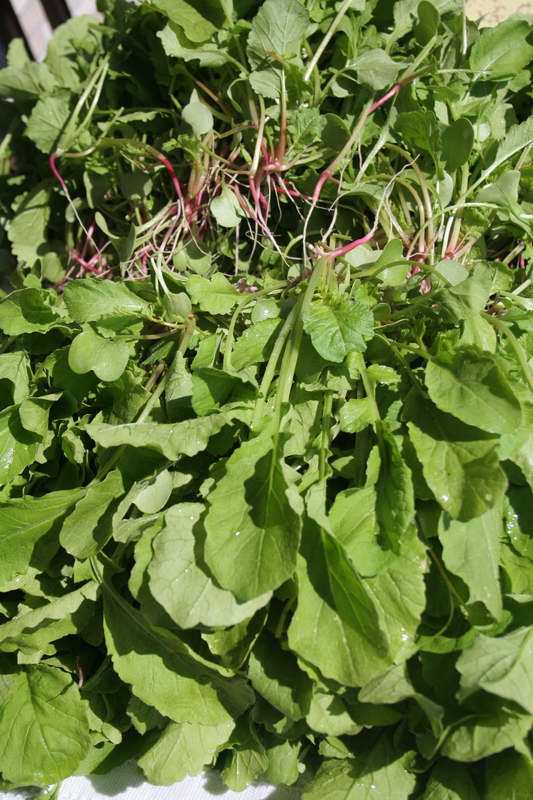 Today was Radish thinning day and we now have beautiful Radish Greens available for purchase. Radish Greens you may think… what are they good for, compost? Radish Greens can be used anyway you would use other greens… sautéed in your favorite stir fry recipe, added to green smoothies, eaten fresh in salad, or on their own. Our favorite way to eat Radish Greens is in Radish Top Soup or raw from the garden. Althea has been picking at them for days now. Radish leaves are high in Vitamin C , Calcium, Protein, Iron, and Vitamin A. They contain nearly six times as much Vitamin C, and higher levels of Calcium and Protein than their roots. They are a member of the Cruciferous family, which contain cancer-protective properties. And like other greens, they are a good source of vitamin K and magnesium. Radishes have been known through out history as a medicinal food for liver disorders, containing a variety of sulfur-based chemicals that increase the flow of bile. Increased flow of bile helps maintain a healthy gallbladder and liver, and improves digestion. Pick up a freshly picked and rinsed bag of Radish Greens today.